Visit the global Police brutality archives for posts from all DGR sites. It is difficult to be radical in Denver. We are so privileged here. There’s a Starbucks and a Whole Foods on every corner; and dog parks and community gardens and it’s all so…seductive. It has an almost soporific effect. One can be lulled right to sleep by the idyllic snow-capped mountains and trendy cafes that suggest there is no crisis here. Our hoods aren’t like hoods in Chicago, Detroit, Jersey, parts of New York, New Orleans, St. Louis…Baltimore. No gritty crime drama about the drug trade and the alarmingly high homicide rates in the inner city could ever be filmed here. We are a little too deft with our trash pickups and our gentrification. Let me start near the beginning. Mike Brown died. We all got tickets to the show. What I knew after the spectacle of horror that social media alerted us to on that Saturday afternoon in August in Ferguson Missouri was that I could not protect my children. That is an impossibly soul crushing thing to carry. Especially for somebody like me; somebody whose adolescence was punctuated by the slings and arrows of too many rapacious men and boys and all of the tripwire that accompanies growing up black and female. The one thing I felt certain about when I became a mother was that I would become a fortress. I would keep my children safe at all costs. They came from me; matriculated from my simple womb ands burst through this skin brilliantly. Being a woman in a patriarchal society makes you interrogate whether you can keep the softer parts of who you are and still defy the limitations of misogyny, but being a mother makes you a wolf. The way I love my children told me I was woman enough and wolf enough to keep them safe. But then Trayvon happened and I felt the ground slipping underneath me. Still, I fought against the despair. I brought my children to rallies that called for Zimmerman’s arrest and I challenged out loud, the notion that Trayvon deserved to be seen as a threat and therefore murdered in the gated community his father lived in. The effort was exhausting and replete with all of the pushback that comes from those whose bodies have never been so undervalued. Zimmerman was not convicted. I watched the verdict come in with my children and cried and lamented and then almost instantly felt naïve to hold out hope that our judicial system, the same system that criminalizes black and brown bodies to feed the prison industrial complex, would care about one black boy walking down a road at night who never made it home. A boy my community iconicized in hash tags and hoodies. See, we are so accustomed to being slain; so accustomed to the lynching ritual and the picnics afterward, sometimes the only fight we can manage is a blog post about white America and Facebook posts about the legacy of racism. My grandfather was born in 1911. He grew up in the Jim Crow south. He knew all about the spectacle of black bodies dangling from trees, burned alive, castrated and beaten. What I could not personally reconcile was that I was having the same conversations about the same culture of violence that he was having as a boy growing up in the West End of Little Rock, Arkansas. Nothing had changed. Martin Luther King’s magnificent legacy did not result in black people being a protected class. Malcolm X’s unapologetic, larger than life, tell you the truth to your face way of being in the world did not stop the slaughter. Both of those men were cut down by bullets in their prime anyway, which should have been all the evidence the following generations needed that this country is willful about its acts of brutality against black and brown people. If we couldn’t be slaves anymore we could be prisoners. We could be disenfranchised. We could be economically dispossessed. We could be squeezed and starved and relegated to barrios and ghettos that would kill us one way or another anyway. We should have known better. But we couldn’t see it…too much blood in our eyes. So Ferguson…it awakened in me the unsurvivable reality that my children could be “legitimately killed.” They could be snatched from me by someone who saw them walking down a road at night and concluded that they were the threat. They were the imposition. Their lives were not valuable. The depression that reached for me was thick. I woke up every morning trying to convince myself that there was still a righteous fight somewhere. That life still held beauty. That I could still love my children seismically and urgently, and protect them from the insistent ugly of the world. I don’t want to suggest that this feeling distinguished me from so many others in this country and around the world who felt uproarious about Big Mike’s body lying in the street for more than four hours and I don’t want to suggest that my suffering was somehow more pronounced than other people. I saw Leslie McFadden pleading with police officers to get her boy out of the street…her firstborn. And I saw those same officers tell her to get back behind the police tape. I saw and heard the eruption of rage that interrupted the consciousness of brothers on the block who were all too familiar with police brutality but who nevertheless could not forgive the offense of seeing that child’s body face down in the street. I carried the death of Mike Brown hard. I still do. I can’t think about him for too long without gnashing my teeth. I can’t think too long about the fact that my own firstborn son stayed up every single night all summer long watching CNN trying to understand what world this is. And I am his mother so it is incumbent upon me to do something, right? To get in between my child and the horror…but how do I do that? What does my fight look like? How can I arm him? I didn’t know. What I do know is that somewhere in the course of grieving for a boy I had never met, killed in a town I had never heard of, was that I was starting to deny my children affection. I didn’t think it was wise to love them up close. I might lose them after all. I died a thousand times just carrying that thought. At some point I did get up. School started up again. Lunches needed to be made. Field trips needed to be planned for. Mike Brown was not entering college but my youngest was starting Kindergarten. I had to have enough daylight in my body to acknowledge that. I couldn’t stop mothering just because I was unsure how to do it without defeat attached to it. Life, or something like it, went on. There was an empty I kept though. Writing elegiac poems about these murdered sons was not sufficient. It was not the revolution I wanted; the revolution that was required. It was too convenient. Too safe. Too academic. I didn’t want to be guilty of that. I was looking for an opening; a way forward; a blueprint. How do I respond rather than react? Many months later I got word that, Anthony Grimes, a dear friend of mine was going to be at a vigil being staged at a police station in Aurora because a black man had just been killed by officers in the middle of the day just a stone’s throw away from an elementary school. This particular man was not a man that was easy to advocate for. He had warrants and an extensive history of assault and domestic violence and had done a significant amount of time in prison. Still, he had been killed and when you choose to stick your chin out over your feet against extrajudicial killings you don’t really get to compartmentalize or choose which victims are deserving of your outrage. Even ex cons, even felons, even unsavory characters don’t deserve to be murdered at the hands of police without just cause. I am notoriously opposed to marches and rallies because it has always felt like the pantomime of action to me. A lot of smoke and noise and signs and songs and 28 hours later another one of us is killed so my cynicism, while admittedly significant, is not without merit or historical context. But Anthony was going to be there and Anthony had gone to Ferguson and to Palestine over the summer and had become activated by the over-muscled need to defend us against such violence. He had risked much and sacrificed much. He started a group called the Denver Freedom Riders but this group was more a movement than a group; a deliberate call to action. For these reasons, I decided to attend the vigil and support my friend. When I got there I saw Anthony along with many other community leaders gathered around the family of the man recently killed by Aurora PD. I could see Anthony’s grief and his rage. I could see his need to do something about what was happening and it mirrored my own need. Thus began my relationship with the Denver Freedom Riders (DFR). It has not been easy. But how could it be? Gradualism and tokenism, which have been thematic to resistance movements involving black people in this country and abroad, can begin to pull at the hem of your garment. There are those that say they wish to fight with you to end the tyranny but the second they disagree with your position, they will call you crazy and disavow themselves from you. There is the quandary of fighting a dangerous fight with folk who think that it should be less inconvenient, more academic, more religious, less radical, more controlled, on and on. That’s not new. Any student of history can find that struggle in every movement. It does not tell me the sky is falling. It tells me the strong ones are rising. Hell, it feels like natural selection to me. If you do not have the necessary scrap and gristle to challenge power and acknowledge the tremendous risk involved, personal and professional, then you should go back to your campuses, your cubicles, and your 401K’s and keep writing papers about police brutality. That is not how I fight. That is not the stuff of DFR. Weeks later, I was in a hotel in Chicago having just performed at the University of Illinois when the Baltimore uprising lifted off. Anthony and I had been talking about Freddie Gray, the young man who was illegally detained by Baltimore City police, roughed up and then subsequently brutalized in the back of a police van that resulted in 80% of his spine being severed from his neck, resulting in his death days later. We were seized by grief and levitating with rage from it all. I walked down to the lobby at the Hilton Hotel the day Freddie Gray was buried and saw young black people throwing rocks and bricks at police officers dressed in riot gear. It rocked me. I watched them climb on top of patrol cars and smash the windows with their feet. I saw them cuss officers and throw tear gas canisters back toward the line of police who were grossly outnumbered and outmatched by the sheer will and rancor of young folk who were done with the slow suicide of starvation and poor schools and miles and miles of boarded up row homes, (the evidence of Wells Fargo’s sub-prime lending practices and the foreclosures that threw so many black families into chaos), and the absence of recreation centers and resources, and the brutal practices of overseers who donned police uniforms and went looking for black men to criminalize, beat up, and murder. These young people were done. I was captivated…and inspired. I’m sure that statement will make some people question whether or not we can continue to be relative to each other. How could I be proud of “looters?” Why would I ever support violence and the burning of buildings? I will tell you how. I am unwilling to keep waiting for America to count us in, to keep killing us and then vilifying us in death. I am tired of America’s violence being the inheritance of historically and contemporarily marginalized people who, when we finally erupt, are told to give peace a chance, and wait on the lord. I am tired of our anger being delegitimized. I am tired. Dog tired. Anthony and I hopped a plane to Baltimore along with Corean, an 18 year old high school student and Kamau, a student at Howard university; two young people who have more courage and clarity than I ever did at their age. When we got into the city the first thing that assaulted us was the sight of tanks and the national guardsmen holding assault rifles, and cops, undercover and otherwise, peppering the steps of the capitol and hanging out in parks, watching more than a thousand protestors insist on justice. We got into things right away. That’s’ why we were there. We listened to the speeches, avoided CNN, talked to folks whose daily reality was the chaos we were seeing, and then finally made our way to meet with Reverend Sekou who was introduced into the consciousness of so many because of the role he played during the unrest in Ferguson. He was in Baltimore standing with the people there as well as conducting a series of civil disobedience trainings. He told us about the experience he and others had the night before when the police started cracking skulls once it was curfew, a curfew that was instituted after Baltimore City Attorney Marilyn Mosby gave a precedent setting press conference announcing that she was going to prosecute all six officers for the untimely death of Freddie Gray. Sekou warned us that if we were going to stay outside and deliberately defy the curfew, that we would need to be careful. We had not yet determined what we were going to do. We just wanted to be useful and needed to spend some time figuring out how to do that. We went back out to North and Penn, the location that was the epicenter of the “rioting” just days before and when we got there we saw grassroots organizations getting kids to paint and Anonymous handing out various anti-capitalism pamphlets, and Black Israelites and anarchists and the Nation of Islam and churches and on an on. We parked our car and as we were passing a basketball court I noticed three young boys shooting hoops. I walked on to the court and spoke to the littlest that I later learned was five years old. I asked him if I could play with him. He looked at me hard and said, “You sure?” “Yes!” I replied. “I’m sure. Shoot the ball.” At the same time, Anthony and Kamau dropped their backpacks filled with water bottles and Maalox and gas masks, and all of the accoutrement of guerilla warfare, and started playing with the two older boys. We did this for more than an hour. It was 8:30pm when we started winding down. I asked the five year old, who told me to call him “Meek Meek” if he was bothered by all of the chaos and he said he didn’t think about it. I asked him if he liked school and he said he had not been able to go on account of his teacher getting shot and the National Guard coming in. Yeah man, I shoot around sometimes but volleyball was my thing. Nah. Do you like to shoot? And then I realized we were talking about guns. “Yes…I do know how to shoot, Meek Meek.” I said. “What gun you like best?” He asked. “Um…I like a 45.” I said, feeling strange about having a conversation like this with a child a year younger than my own baby. He looked at me and said, “Oh that means you know how to shoot. I like a 9. 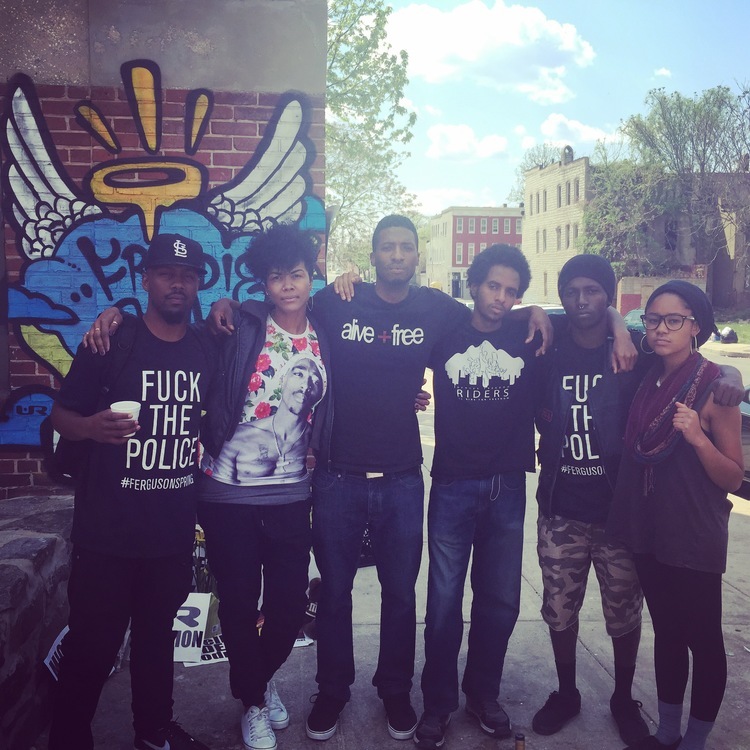 No kickback on it.” And see, that is the distance your consciousness has to travel to understand Baltimore and how mighty the people there are, how warrior they have had to be. Theirs is a life that has to be muscled through. But be clear: during our time in Baltimore I didn’t meet a single victim. Not one. The politics of oppression are not always about the breaking and the broken. Sometimes it’s about the breaking and the undeniably unbroken. That doesn’t mean there are no bruises. It certainly doesn’t mean there are no casualties. There are so very many casualties. Those battle lines are drawn in this country over and over again and whether you will survive in spite of or because of is largely about your melanin content, your zip code, and your gender. We said goodbye to the boys and it was hard to say goodbye. I fell in love with Meek Meek, the five year old who had the best shot out there and who looked longingly at me when I told him I had to go. I have thought about him every single day since the day I met him. I wonder if he is ok. I wonder if they opened his school, if he is getting at least two square meals again (because when they closed the schools in Baltimore they denied 85% of the children in those schools food since they rely on the Free and Reduced Lunch program.) I wonder if he knows how much he meant to me. And I wonder how I can see him again. North and Penn at night was not what it was during the day. During the day it almost felt like a block party; like Juneteenth. Loud music, a DJ, people dancing, laughing, strategizing. But while that was happening, a militarized police force was surrounding us on all sides, watching everything we did. At night though, we could feel the shift in energy. Something was going to happen. You just knew that. Joseph Kent suddenly walked to the middle of the street, bullhorn in hand, and started asking people to join him. We started following him as he led us in a march away from North and Penn and toward the inner harbor. We walked for about forty minutes. When Anthony checked his watch it was 9:30pm. Curfew was at 10pm. We knew getting back to our car by curfew was going to be tough. We were trying to decide whether we were going to stop right then and turn back when an 11-year-old kid walked up to me and asked if I was going to stay out there with him. He said he defied the curfew the night before and had witnessed police officers beating people once the clock struck ten. I asked him how he managed to escape and he said, “You just gotta know how to move.” Then looked at me again and said, “So…are you staying out with me or not?” “Of course I am.” I said. “No way are you gonna outlast me. If you are out here then we are too.” I continued and Anthony readily agreed. The kid looked at all of us and grinned then walked over to Anthony and asked if he could borrow his gas mask. Anthony accommodated him. The kid immediately put it on and kept marching. Minutes later a CNN correspondent walked over to us and asked me if I was willing to talk to them. I am sure they were captivated by me walking shoulder to shoulder with a kid in a gas mask, but I also think they surveyed the crowd and determined that our crew would be the most “user-friendly.” Maybe I’m projecting but that’s how it felt to me. I looked at Anthony for direction and Anthony said, “No. We are not interested” and that was that. CNN’s coverage of Baltimore was abysmal and divisive and misleading anyway so that choice was the one with the most integrity, I think. At ten minutes ‘til 10, riot police started moving in along with helicopters hovering overhead shining bright lights down on all of us. A tank pulled up on our right side essentially pinning us in. We couldn’t go back because the riot police were behind us. We couldn’t go right because the tank was there. We couldn’t reasonably go much more forward because we could see a line of officers already lined up behind their shields ahead. Suddenly there was an announcement over a loud speaker that curfew was imminent and that soon we would be in violation of it. The anxiety from the crowd was palpable. There were some white boys in Guy Fawkes masks rolling around on skateboards flipping cops off, there were others in gas masks trying to advise us, one lanky brother was moving through the crowd telling us to stay together by any means necessary. He was so frenetic it made me nervous. He was telling everyone to calm down but he himself was electric with worry and you could see it in him. When it was 10pm the pepper spray came. Along with sirens and flashing lights and cops running after us with their guns out. People were screaming and fleeing and in my mind there was only one place to go that did not have the apparent presence of police. Down a dark side street to the left, which is where we went. We ran. We ran and felt all of the terror our ancestors must have felt when the slavers came, when the paddy rollers came, when the only thing in your head is NO. YOU WILL NOT TOUCH ME. It was an old feeling. It is a dangerous knowing. We dipped into the projects. We didn’t plan on it. We had no plan except to get the hell away from the same old hands that have been chasing us for centuries. We went where we saw an opening. We found ourselves in a dark courtyard. There was no one around. I saw two chairs in front of someone’s apartment and suggested that we sit down in them and pretend to be at home. I figured they were looking for people who were running, people who were scurrying, people who appeared to have no belonging. I pulled one of the chairs out and at that moment, a fair skinned black woman with a stern face opened her door and asked us what was going on. Corean told her that we were running from police officers that meant to harm us; so many people had been harmed already. The woman told Corean to go inside then looked hard at me, Kamau and Anthony. Corean is a petite, baby-faced beauty, but Kamau is a young black man who, in that moment had a wild in his eyes having run from riot police, Anthony is 6’4” and undeniably black and I, myself, am 6 feet tall. The woman looked at each one of us for a moment more and then opened her door wide and said “Go inside. But you be careful coming in my house because I don’t know you.” She let us stay there until it was safe to get away. The kid in the gas mask we were walking with was arrested. Joseph Kent, the dazzling young activist, was arrested by the very officers who were telling him as we were marching that they would NOT do so. I saw a girl who looked to be about 13 years old, clotheslined by a cop as she was running away from riot police. Her head hit the pavement hard. I keep hearing her screams in my head and the terrible smack of her head crashing onto the concrete. Things CNN didn’t show you. I saw police officers snatching people off of their porches, their own front porches, and putting them in police wagons because of that ridiculous curfew. I saw it. I never saw the media seek to have the relevant conversations. I never saw them really expose and condemn the officers who kept the media safely behind the caution tape while they pepper sprayed people for exercising their rights as human beings before snatching them down to the ground by their hair and dragging them on their faces. 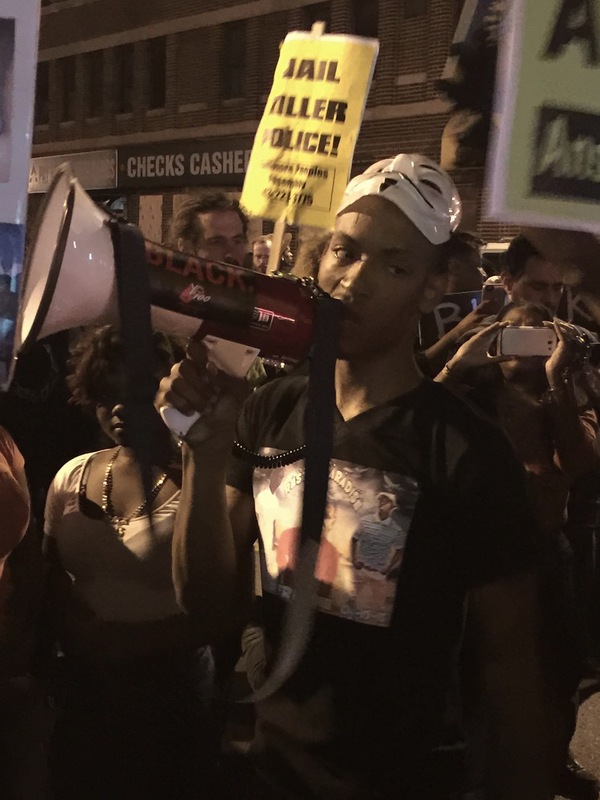 Instead, I saw media talking to protestors about the burned out CVS and the legitimacy of defying the curfew without ever interrogating how criminal it was to issue that curfew in the first place and the way it squeezed and oppressed a community already rocked with appropriate grief and rage. I should tell you about the “write-in” we went to the next day at a church for high school aged students who were there to talk about what was happening in their city. I should tell you that as well meaning as the organizers were who put the event on, none of them lived in the city. They lived in the suburbs. I should tell you that the kids who were in attendance (about 12 of them) came from private schools and therefore, could not really talk from the inside of things the way 5 year old Meek Meek could. Still, writing is a meditation. It is a balm and a blessing and in that regard what happened in that room was still important. 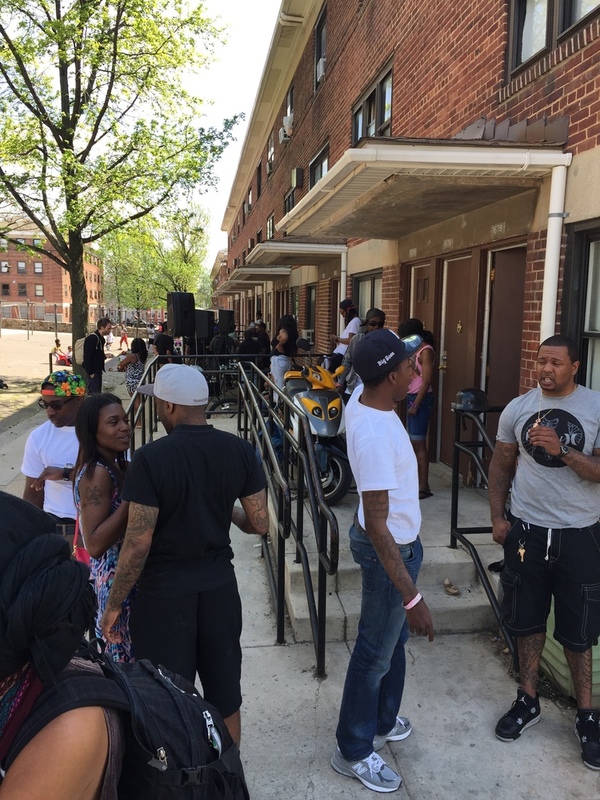 We went to a barbecue after that being held at the Gilmore Homes where Freddie Gray was arrested. We stood in the exact spot where Freddie was tackled and abused by Baltimore Police where a memorial now announces the birth and death dates of Freddie, spray painted on a brick wall with a halo over Freddie’s name. We met the man who videotaped Freddie’s arrest on that fateful day, who is a part of a group called Cop Watch. We saw Amy Goodman from Democracy Now interviewing the residents too and we ran into three brothers from Ferguson who had also flown in to offer their support. We saw the residents of the Gilmore Homes with their kids who were finger painting, playing touch football and rolling around on tricycles. They talked about Freddie and how they saw him everyday. They talked about a place called Mama’s that had been set on fire; a fire the police claimed was started by gang members but according to residents, was set by the officers themselves. We heard many stories like that. How the Baltimore Police Department claimed a “group of criminals” set fire to a trash can and then an independent journalist who was on the scene said on twitter that, in fact, the fire was set by a grenade thrown by the Baltimore Police that landed in that trash can, setting it ablaze. I guess maybe that’s why I have decided to write all of this down. It is the acknowledgement that those in power always describe us as thugs and monsters, looters and thieves, rioters and hoodlums and if we do not challenge that narrative, if we do not stand up and tell our stories, the people in power get to keep killing us and claiming that we deserved it. Without the truth, they get to disappear us, they get to stop us about a tail light and then shoot us in the back, plant evidence and claim we threatened their lives; they get to arrest us because we made eye contact with them, beat us, hogtie us, and then throw us into a police van on our stomachs, unbelted, handcuffed and bruised to be thrashed against a metal partition until our spine is severed. No. I am a mother to children who will outlive me. They will occupy their bodies brilliantly and without apology. They will inherit a world that does not shrug with indifference when people die, when the state sanctions that violence and then lies to cover it up. They are deliberately black. Unbroken. Unkillable. And as long as my heart is beating I will wake up every morning and work long into the night making that the reality for us all. How could I not? I met a five year old and an eleven year old who are willing to do as much. And while I got to get on a plane two days later and leave hell, nothing in me will ever pretend I didn’t see what I saw, know what I know and go back to the convenience of dog parks and manicured lawns and let them stay there and burn. This entry was posted in Repression at Home, White Supremacy and tagged Courts, DGR writing & analysis, Dominique Christina, Ferguson, Maryland, Police brutality, 4: Civilization is based on hierarchy on May 28, 2015 by DGR Colorado Plateau. We all know the rules: you’re allowed to vote for either one capitalist or the other, vote with your dollars,2 write petitions (you really should sign this one), you can shop at local businesses, you can eat organic food (if you can afford it), and you can do all kinds of great things! 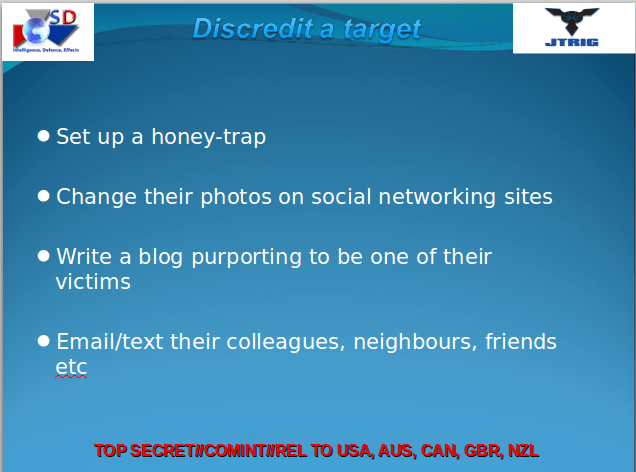 Here is one illustrative list of tactics from the JTRIG leaks. I’ll be clear: I don’t mean to claim that the “Letter Collective” (as the anonymous authors of the February 23 article named themselves) are agents of the state. 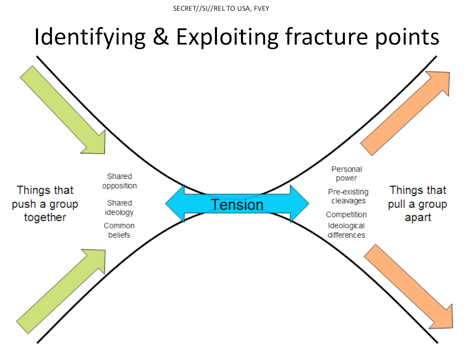 To do so would be a violation of security culture.5 Modern activists seem to have largely forgotten the lessons of COINTELPRO, and I am wary of forgetting those lessons myself. Snitchjacketing is a bad behavior, and we should have no tolerance for it unless there is substantive evidence. Max Wilbert lives in the Pacific Northwest, where he works to support indigenous resistance to industrial extraction projects, anti-racist initiatives, and radical feminist struggles as part of Deep Green Resistance. He makes his living as a writer and photographer, and can be contacted at max@maxwilbert.org. Read other articles by Max. This entry was posted in Gender, Repression at Home and tagged Blacklisting, DGR writing & analysis, FBI, Horizontal hostility, Max Wilbert, Occupy Movement, Police brutality, Security culture, Stratfor, Transgender & Transphobia, 13: Those in power rule by force on January 31, 2015 by DGR Colorado Plateau.